This book and the Problem Solution Manual will be invaluable to students, professionals, and specialists as practical reference guides to different hydraulic processes. The book follows water: from its entry to the reservoir, in the reservoir, in the approach channel, on the control structure, in the discharge channel and in the downstream river up to a control section. To help understand the different concepts, problems are included in the text, with additional problems and solutions given in the Problem Solution Manual. Chapters 1-5 describe spillways that are most often used in engineering practice. Chapter 1 discusses the historical background of dam construction worldwide. Chapter 2 introduces the basics of dam spillways such as spillway design; components; layout; type, and classification. Chapter 3 and 4 analyze the hydraulics of free-flow spillways and gated spillways, respectively; and Chapter 5 discusses the hydraulics of special types of spillways, broad-crested weir spillways, side and lateral spillways, shaft spillways, siphon and compound spillways. Downstream channel hydraulics is discussed in Chapter 6. The forces involved in stability analysis such as static and dynamic loads on spillways are brought up in Chapter 7. 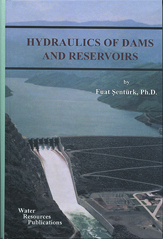 Chapter 8 addresses the hydraulics phenomena in reservoirs such as waves, density currents, sedimentation, etc. Chapter 9 deals with the hydraulics of the bodies of dams. The osculation devices used for measurement purposes and interpretation of measurements are also presented in this chapter, together with hydraulic computations. Chapter 10 discusses feasible solutions associated with the detail design of upstream and downstream cofferdams and diversion tunnels. Different problems concerned with outlet works and their solutions are outlined in Chapter 11. Chapter 12 addresses different effects on the degradation, aggradation and local sour in downstream channels at dams. Chapter 13 will help design and model engineers work together. Many of the problems which were solved on scale models are today submitted to computer analysis. The resuls attained rapidly and efficiently. Attention to this feature is given in Chapter 13 and in the Problem Solution Manual. ISBN # 0-918334-80-2. Publ. 1994 WRP. References -- Author Index -- Subject Index.